Gianmario Cerutti’s family own 6ha of prime sandy calcareous soils at Cassinasco, 480metres above sea level overlooking Canelli, the Moscato d’Asti & Metodo Classico capital in the Langhe Astigiani (& of Italia!) 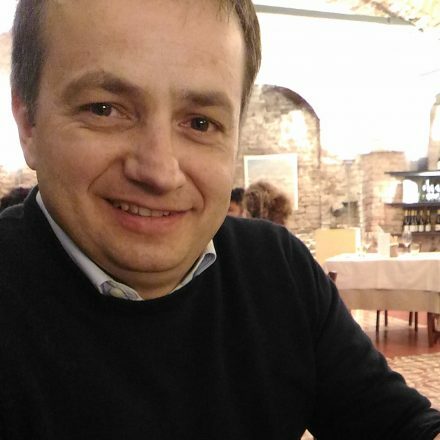 No surprise then that Gianmario focuses his energy on producing primarily a Moscato d’Asti Canelli DOCG & (since vintage 2015) an Alta Langa DOCG. Gianmario’s grandfather, Enrico 1, bought the current Cascina in 1931, selling off the fruit. In the 1940s, the family started to vinify their fruit before the first bottling in the ’70s. Fourth generation Gianmario graduated from Alba’s viticultural school Umberto 1 in 1992 & began at the family cantina in 1994, while also moonlighting as a key buyer/winemaker at the Coppo winery. Indeed it is here that their Alta Langa is aged & bottled. They make the Moscato d’Asti Canelli from two sites: ‘Suri Galle’ at 380m asl SE facing, e ‘Suri Sandrinet’ at 320m asl, SW facing on white sandier soils. Since vintage 2011, Gianmario has also been sourcing fruit to make a Metodo Classico, now Alta Langa DOCG, from two sites: 80% Pinot Nero from white calc & limo (silt) vineyards in Bubbio, in the Val Bormida, & 20% Chardonnay from white sand & calc Cassinasco, in the Val Belbo at between 300 – 400m asl. From the 2015 vintage this wine has now become Alta Langa DOCG Brut. His father Enrico II breeds pretty, prize-winning canaries so the Cascina shrills to birdsong. His mother Luciana makes a delicious ‘torta di nocciola’ (hazelnut cake), & his wife Anita works along her family at the excellent Ristorante Casa Crippa in Canelli! In his spare time (! 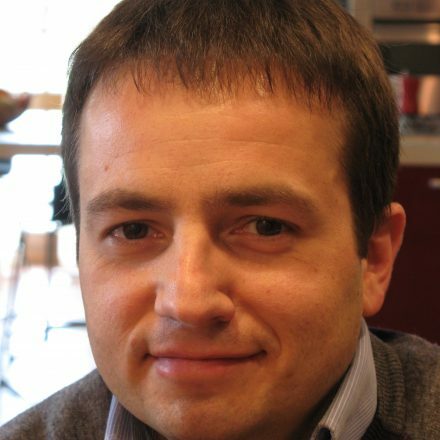 ), Gianmario is also Presidente of the Associazione Produttori Moscato di Canelli; an associated member of the Consorzio dell’Alta Langa; & on the Consiglio (Board) di Amministrazione della FIVI (Federazione Italiano Viticultori Indipendente)! The ‘Canelli’ denominazione of Moscato d’Asti applies to Gianmario’s wine because the village of Cassinasco is one of the 23 communes in the ‘Canelli’ sub-region famous for Moscato d’Asti; Canelli comprises 95ha, while Santa Vittoria (Roero) is only 2ha, & Strevi 0.5ha! Current total Moscato d’Asti production in 2017 was 35 million bottles; Cerutti produces 8,000! 80% Pinot Nero from Bubbio & 20% Chardonnay from Cassinasco, so between 300 – 400m asl, on white calc & silt soils above Canelli, the birthplace of Italian Metodo Classico with Camillo Gancia in 1850. Total 1.7ha! Very pure, vertical, straight-laced, no indulgence or excess dosaggio, nicely poised, transparent & clear, like the label! NV (2013) ‘Enrico Cerutti’ VSQ Metodo Classico – while Cerutti is best known for their scintillating Moscato d’Asti, quickly gaining ground is their Metodo Classico that’s to be released as a Alta Langa DOC in 2018 (with the 2015 vintage). Currently they’re offering the 2013 vintage (not on the label), 85% Pinot Nero (from a friend close to Cassinasco) & 15% Chardonnay (their’s), 34 mths on the lees in bottle, disgorged with the same wine & no ‘liqueur d’expedition!’ in July ’16, c.3.5k bts. Biscotti al limone nose, cedro/candied fruit, almond & lime cheesecake fruit! Being 2013, it’s nervoso, subtle, refined, the high quality reminding us of Canelli’s role as a pioneer of great Metodo Classico in Italy (before they invented the Martinotti/Tank system & exported it to France, as Charmat!). Excellent, & stylish packing too! Circa 5 grams of RS. The creamiest, beadiest, finest bubbled Moscato d’Asti that Gianmario has ever made! 2017 Moscato d’Asti Canelli ‘Suri Sandrinet’, Cassinasco – tasted Marzo’18, 5%, 150grams of RS, in 2017 their harvest was a month earlier, on 25 August vs 20th Sept in 2016. They are fortunate in owning the fresh SE facing ‘Suri Galle’ vineyard at 380m asl, that accounts for 60% of the final blend, while ‘Suri Sandrinet’ gives richness from its 320m asl, SW facing slopes (40%). Notes of pears & straw; very fine, distinctly Vermouth nose, with delicate, refined, nettly meringue, breezy, light on its feet, exhilarating fruit. As if one can feel the light, white sandy soils, the fossils & active calc. Yellow apples, golden delicious?! Production 8k bottles/annum.